Emily Nolan has become a violinist in high demand during her residency in Tucson. She is pursuing a doctoral degree at the University of Arizona in Violin Performance, under the direction of Lauren Roth. Emily received her master’s degree from the University of Arizona, while studying with Mark Rush. 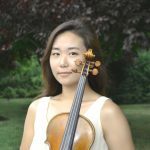 For her undergraduate studies, she attended the University of Connecticut and received a Bachelor’s of Music in Violin Performance. She studied under Dr. Theodore Arm during her attendance at the University of Connecticut. Emily has also studied with world-renowned musicians during various master classes and festivals, including the Juilliard String Quartet, Ani Kavafian (Yale University), the Pacifica Quartet, the Orion String Quartet, and Martin Beaver (Tokyo String Quartet). Emily is currently a member of the Tucson Symphony Orchestra, True Concord (formerly known as Tucson Chamber Artists), and the St Andrew’s Bach Society.